Originally this range of 1/76 scale white metal handbuilt models of land speed record cars was offered by Bellini Models Ltd.(Tony Bellm). The models were actually made by R.A.E. models in the UK. 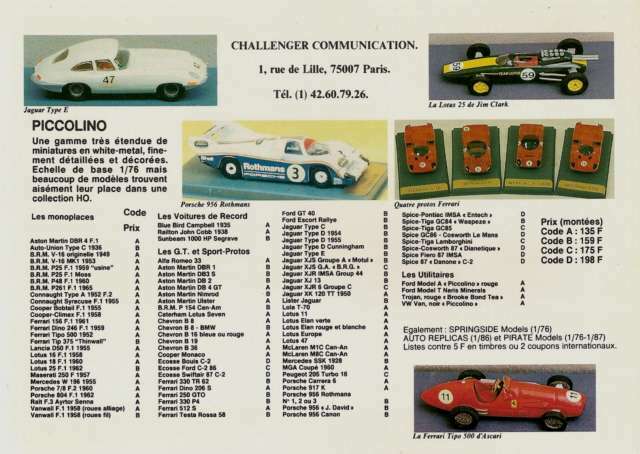 Thanks to Philippe Langevin we can show you this scanned advertisement from the French magazine HO Véhicule International #8 (originally printed Dec. 1988). There are a lot more models in the ad then in the list below, unfortunately the ad does not mention any ref#.